Home Kindergarten Lesson Plans Cute "Hands-On" Way to Learn About Texture! We recently came across a really cute idea for teaching texture. Christina over at Bunting, Books & Bright Ideas shared the idea and we think it would be a perfect addition to your unit on matter! You'll need just a few supplies before you get started. Provide each of your kiddos with a hand print and a small piece of each item. Then have them come up with a word they would use to describe the texture of each item and write the word on each finger. At the tip of each finger, have them glue the corresponding item. Easy peasy! And a great way to learn how to describe matter. We also liked Christina's classroom display for those cute hand prints! 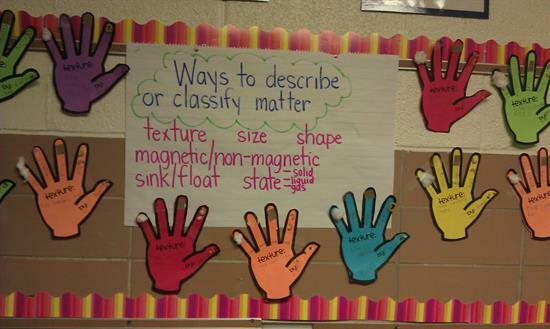 On a large piece of white paper write down different ways to classify matter and then surround it with all of your hand prints to show off that you learned all about texture. For the FREE printable hand print and to check out Christina's amazing blog, be sure to head over to Bunting, Books & Bright Ideas!